There is almost something you can convert one dish to when you get tired of eating it. 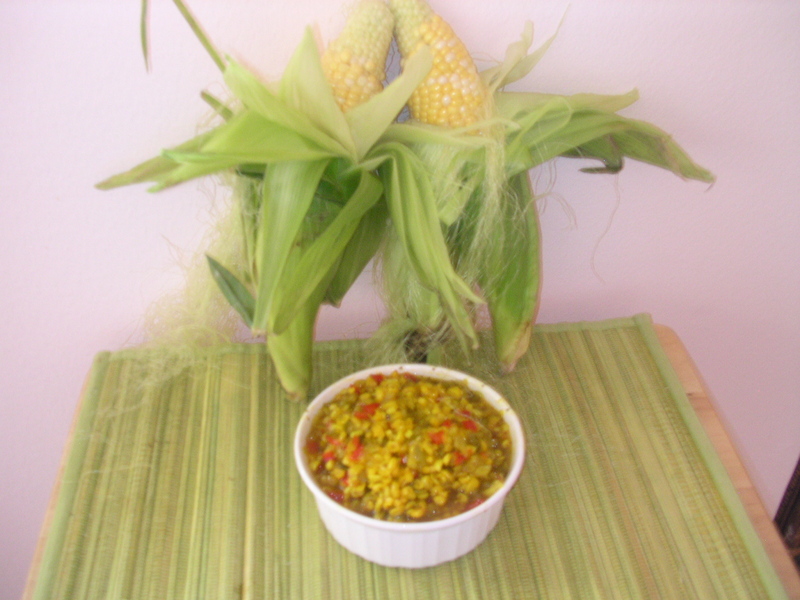 Since it is corn season, I tend to use a lot of corn whether it be ‘corn on the cob’, corn salad or corn relish. The problem is that sometimes we get carried away and make too much of one item. If so, let the imagination come into play and convert that leftover item (provided it is not too old) into something new and wonderful. After eating the corn relish for one or two meals and even using it on sandwiches, it is time to change condiments. Don’t want to waste all that wonderful corn so it is going to be turned into pasta salad. Just take the leftover relish and place it into a medium size bowl (or whichever fits your leftovers). I added sliced olives to it and then cooked up some penne pasta. 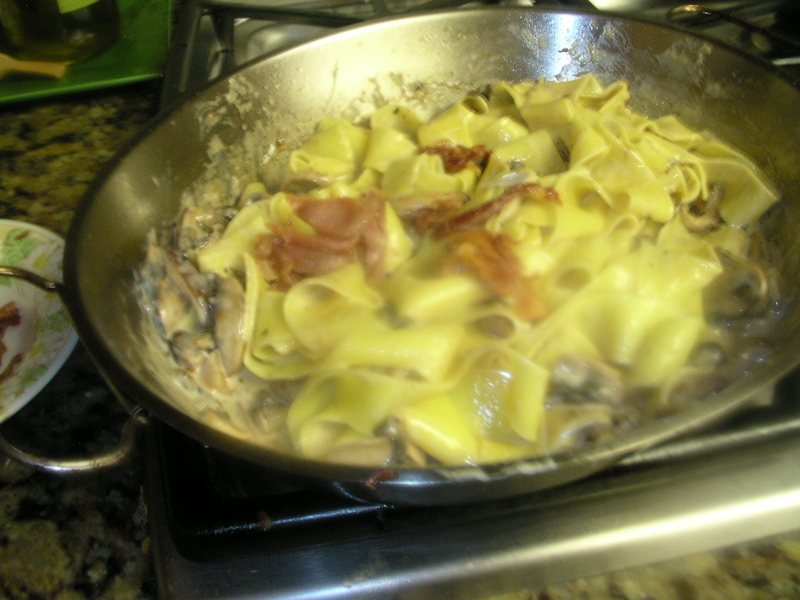 You can use elbow, farfalla (bowties), ziti or whatever kind you prefer or if you have leftover cooked pasta in your refrigerator or freezer, just use that. If you are using penne pasta, it will take about 12-14 minutes to cook in salted boiling water. Drain the pasta well and add to the corn relish and sliced olives. Add some diced celery and a little mayonnaise. Taste for seasoning and if need be add a little salt and pepper and maybe some garlic powder. Refrigerate until ready to serve. This makes a good side dish or if you add some diced chicken or ham you will have an entrée salad. This is quick and easy eating and it still tastes good! Try using your leftovers to create something new. Small quantities of leftover meats are perfect for pasta salads, especially in hot summer weather. It is ‘easy eating’ time! 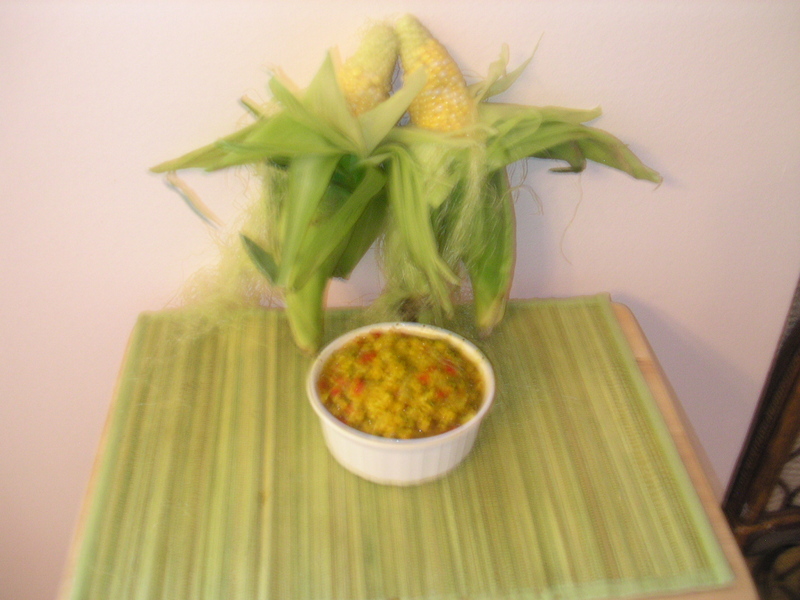 right off the cob and if the corn is really good, it will taste good without being cooked. I always test the corn before cooking it to see if there is enough sugar content in the kernels. If it doesn’t taste sweet enough, then I will add a teaspoon or two of sugar to the cooking water along with the juice of half a lemon. Bell Peppers (without the seeds of course). Finely dice the Celery. In a large pot Cider Vinegar along with Sugar, Salt and Spices are brought to a boil. The vegetables are then added to the liquid and simmered for 20 minutes. 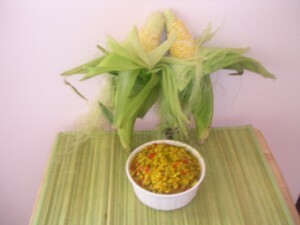 The six ears of corn along with the added vegetables will yield 1 quart of relish. I served the relish for dinner along with our barbecued tri-tip, tomato salad and fresh ciabatta bread. For the complete recipe, check our recipe section under condiments. When you walk down the pasta isle in the market how do you choose which pasta to buy and which to use for what purpose? There are flat pastas, round pastas, hollow pastas and twisted pastas. There is pasta that is made to look like rice (Italian orzo) and pasta that resembles gnocchi (potato dumplings). There are shells and tubes and then there is pasta that is made into shapes to fit the season. To clear up some of the confusion, this will be an ongoing series that deals with different types of pasta. For our first installment we will deal with the flat pastas. But before we get into the shapes of pasta, you might want to consider what pasta is made from. The best quality pasta is made from semolina (hard durum wheat) and eggs with maybe a little salt and some olive oil thrown in. There is pasta that has no eggs in it and then there is pasta made for those with gluten allergies. To avoid pasta with gluten, you can buy rice pasta usually in the Asian Isle in the market) and pasta made from corn flour. There is pasta that is made domestically and then there is the imported dried variety. There are many types of Italian Pasta, most of which are very good. It used to be very difficult to find pasta imported from Italy, but now you can find them most anywhere. There is fresh pasta which you can usually purchase from your local Italian deli or you can make it yourself. There are many pasta machines available on the market which help to make the production of pasta at home a fairly simple task. The best way to cook pasta is to have plenty of boiling water which has been salted. The salt not only helps to flavor the pasta, but it also increases the temperature of the water which makes the pasta cook more quickly. Dried pastas usually have a recommended cooking time on the package and it is wise to follow that at least until you have cooked the pasta at least once. Pasta should be cooked to ‘al dente’ which means “to the tooth”. You should be able to bite into it, but not have it crunch. The flat pastas include lasagna, linguini, fettuccini and papparadelle. Dried Lasagna noodles are usually about 2-3” wide and can be purchased in boxes either uncooked or precooked. Domestic lasagna noodles are longer than the imported ones; however most of the imported ones are of a better quality. You can usually also purchase fresh pasta which can be used for lasagna from your local Italian deli. Lasagna may either be served simply with a Bolognese (meat) sauce with shredded parmesan or more traditionally as a layered casserole. The sauce for lasagna can vary from marinara (tomato) to Bolognese, mushroom, vegetarian or seafood. There will usually be a layer of pasta, a layer of ricotta cheese, a layer of sauce and a layer of mozzarella. 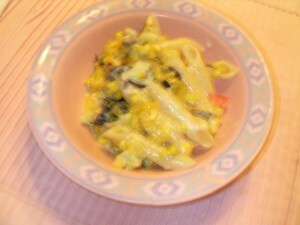 Sometimes the pasta and cheese is layered without the sauce and the sauce is added at serving time. The narrowest of the flat pasta is linguini; linguini is long narrow pasta (about ¼” wide) which can be served with any number of sauces. A favorite that is served with linguini are clams in either a white wine sauce or a spicy red sauce. The next size up is fettuccini which is usually served with an Alfredo sauce (cream or béchamel) made with butter, heavy cream and parmesan. It is utterly delicious, easy and simple to make and loaded with calories. Not for those who have to watch their cholesterol intake! Other than lasagna, papparadelle are the widest at about one inch in width. Papparadelle can be served with most any kind of sauce. Papparadelle go especially with vegetables primavera as they provide a nice contrast to the vegetable and are substantive enough to provide contrasting texture and flavor to the vegetables.